Antique Boston & Sandwich red pears paperweight. Two russet pears hang from opposite sides of a slender stem shared with four serrated, dark green leaves, over clear ground. "The Americans generally shunned the multi-faceting treatment, and instead simply showcased the individual fruits in all their glory. Most of these refreshingly simple designs give the appearance of fruit just plucked from a tree. 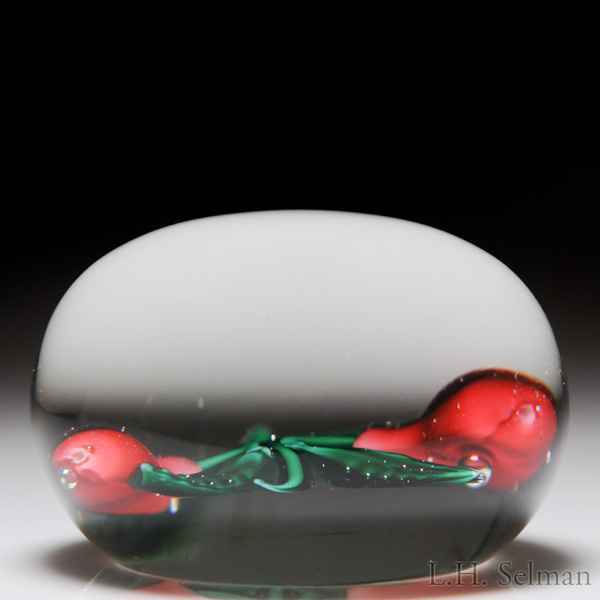 "–The Art of the Paperweight–The Boston & Sandwich and New England Glass Companies. Diameter 2 3/4".